SAN FRANCISCO -- A waitress recently got a generous tip, along with a sweet note, thanks to one man's tradition of honoring his late brother. The man apparently ordered a hot dog at a restaurant, and tipped the waitress 36 dollars. A note on the back of the receipt read, "Today is my brother's b-day. He would have been 36 today. 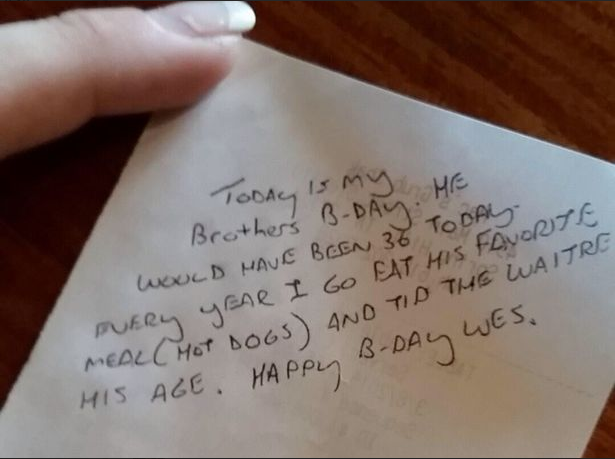 Every year I go eat his favorite meal (hot dogs) and tip the waitress his age. Happy B-Day Wes." The waitress shared a photo of the note online to imgur, writing, "This guy sat in my section & left a note on the back of his receipt." The sweet note has since gone viral, with more than 1 million views.